Have you ever wanted to find a tie back to a famous relative? I always thought it would be cool to say I’m a descendant of someone famous. Now here’s a little link to some Benton family fame. This information comes from Joan Benton Barber… (her father is Rueben Clark Benton, the brother of Robert Hugh Benton. Robert Hugh Benton is the father of Gordon Benton, my grandfather). Joan has provided me with the genealogy of the Benton family back to some of the passengers on the Mayflower and the first settlers in Plymouth. Some of these ancestors were also present at that famous 1621 Thanksgiving that we celebrate each year! I have also heard that Paul Benton may also have this information connecting the Benton’s back to the Mayflower. It would be nice for us to get that information together and verified with what you have. So here is the genealogy according to Joan. 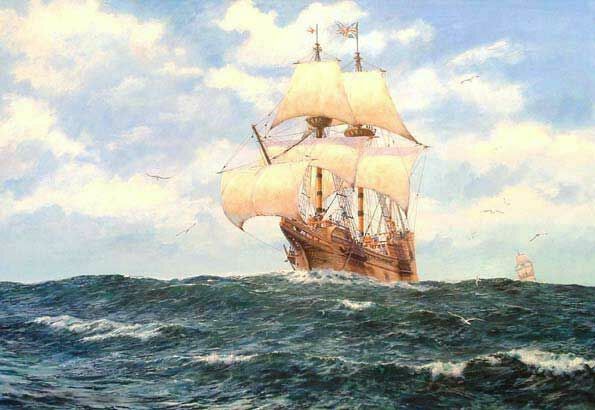 John and Eleanor were on the Mayflower and settled in Plymouth. I am a 12th generation descendant of John Billington. Read on below for a little more details about our ancestor John Billington. If you look at the details about John Billington we learn that ” The Billington family was Plymouth Colony’s troublemakers.” John was hung for murder in 1630 and his oldest son went missing before he died. We are decedents of his younger son Francis. On a positive note Eleanor was one of only five adult women to survive the first winter and only one of four to participate in the famous 1621 Thanksgiving. This is according Eleanor’s mayflower history page. Well there you have it. Please post any comments and any information related to this genealogy! Oh my!! Very exciting to link back to the Mayflower and the Plymouth Colony!! I hadn’t realized that only 4 women survived to participate in the First Thanksgiving and your ancestor was one of them. Wow!! Do you have an ancestry.com account? I do and I’d like to invite you to visit my trees and such so we can coordinate the genealogy. Also if have links to the other stuff on ancestry.com if you could post them… then we could have them documented here. I am looking into the roots of Israel Sabin. He was born in Titchfield, England . His life from Titchfield to the Plymouth Colony is a mystery. Did he sail on Mayflower !!? Is there evidence that he was a Puritan and spent time in Holland.? I have just started doing some research of my own on our family tree. My dad told me years ago that we were descendants of Francis Billington and I would love to get more information. Do you have any other information on the Billington family? I am doing my genealogy and I am a descendant of John Billington also. I am in the process of trying to locate information. My grandfather was Harry Peckham the son of Elisha Peckham married to Sarah Hill Sabin, dau of Alfred Sabin and Eliza Lewis, son of Samuel Sabins and Olive Brown,son of Samuel Sabins and Sarah Hill, son of Elijah sabins and Susannah Sharp and back to Samuel Sabin and Mary Billington. I am having problems with all the Samuels and lack of documentation. I am the great grand daughter of Hugh Henry Benton. My grandfather was Robert Hugh Benton and my father is Wayne Hedges Benton. I have recently begun to work on my geneaology and this website has been most helpful. I live in Wisconsin. Did you have a book about our ancestors up to Robert Hugh Benton? I thought my dad had a book from you, but it was lost. There is a poting from Debby (Benton) Luttenberger on this site. Can anyone tell me how I can get hold of Debby. She has some Hoernig/Potter ancestors and relatives in common with me. Now here’s a little link to some Benton family fame. This information comes from Joan Benton Barber… (her father is Rueben Clark Benton, the brother of Robert Hugh Benton. Robert Hugh Benton is the father of Gordon Benton, my grandfather). Please verify the changes are correct. Sorry that I did not respond earlier. I get a lot of spam messages and had missed your comment. I will be more careful in the future and am excited and thankful for all your amazing work. I just joined the Plantagenet Society and was approved. Also, I joined the Magna Charta and have all the proof. @Chris Malcolm Just saw your post on this site. You can reach me at tomndebby@comcast.net. I’m happy to share any info I may have on the Hoernig or Potter lines.